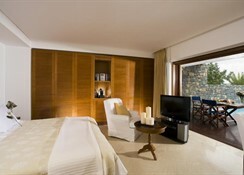 The Elounda Beach Hotel & Villas is an upmarket, high-end, luxury hotel located in Elounda, Crete in Greece. 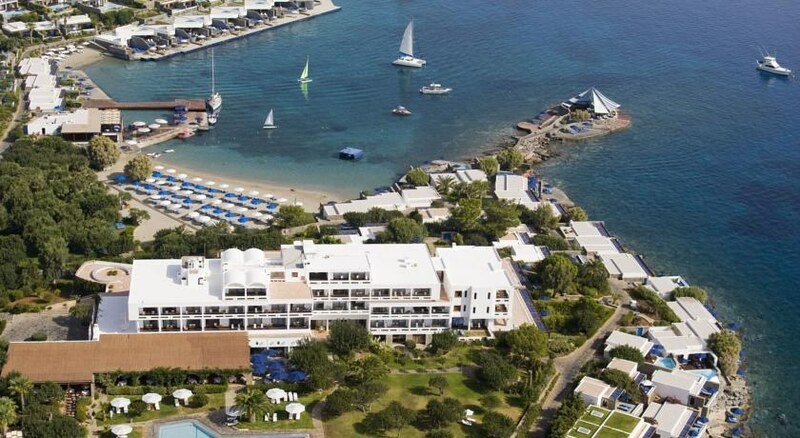 The luxury hotel is set against the Cretan sea and the nearest beach is less than 50m away from the hotel complex. Guests can take a refreshing dip at any of the multiple swimming pools on its premises, which serve as an excellent recreational option for the vacationers looking for a relaxing, sunny holiday. The hotel also houses a high-end spa and wellness centre. The hotel houses 7 restaurants and 4 bars that serve a variety of local Greek and international cuisines along with various alcoholic and non-alcoholic beverages. The property’s beachfront location and proximity to the town of Elounda makes it an ideal destination for people looking to spend a sunny and relaxing vacation in Greece exploring the rich local culture and heritage. The Elounda Beach Hotel & Villas is located 105km away from the Sitia Public Airport and 70.4km from Heraklion International Airport. The closest beach is less than 50m away from the property. Tourist attractions like Spinalonga, Archaeological Museum of Agios Nikolaos, Panagia Kera Church (in Kritsa), Lake Voulismeni and Agios Nikolaos Port are located within a range of 6km from the hotel. The Elounda Beach Hotel & Villas houses 219 guestrooms and suites, which have been designed with utmost detail and a fusion of traditional Greek and contemporary architecture. The hotel has categorised the guestrooms in 18 types based on space, amenities and number of occupants. Deluxe Hotel Suite Sea View, Island Suite on the Water's Edge, Deluxe Hotel Suite Sea View (2 Adults + 1 Child), Deluxe Hotel Suite Sea View (2 Adults + 2 Children), Classic Room Sea View, Classic Bungalow Sea View, Deluxe Room SPA Garden View, Deluxe Room SPA Sea View, Deluxe Room SPA Sea View Sharing a Long Pool, Deluxe Room Garden View- Spa Building (2 Adults + 1 Child), Deluxe Room Sea View – SPA Building (2 Adults+1 Child), Wellness Waterfront Island Suite, Premium Hotel/Bungalow Suite Sea View, Presidential Bungalow Suite Waterfront Private Pool, Yachting Villa Sea View Private Pool, Deluxe Hotel Suite Sea View (Two Bedrooms & Sitting Room Separate), Deluxe Family Room SPA Garden View and Deluxe Family Room SPA Sea View are the types of rooms available. The rooms are equipped with all modern day equipment like flat-screen satellite TV, air-conditioning, direct-dial international telephone, free Wi-Fi, outdoor Jacuzzi, private bar, mini-fridge, hairdryer, luxury bathroom amenities, bath linens, bathtub, toiletries, electronically controlled curtains and blinds, music system and TV in bathroom, etc. 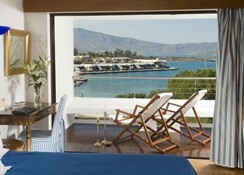 The Elounda Beach Hotel & Villas houses 7 restaurants and 2 bars on its premises. Dionysos, Argonaut Seaside Restaurant, Blue Lagoon by Mistura, Kafenion Greek Restaurant, Artemis, A.N.D Artemis Night Dinnera and Thalassa are the restaurants. The restaurants serve a wide range of delicacies of local Greek and international cuisines. The bars, Veghera Bar and Lito Lounge, serve local wines, beers, cocktails, alcoholic and non-alcoholic beverages. The guests can also visit Crete and Elounda and try the restaurants and bar that offer local Greek and international delicacies along with local wines and signature cocktails. The Elounda Beach Hotel & Villas houses multiple swimming pools where the guests can indulge in pool games and enjoy a refreshing dip. The proximity of the beach also allows the guests to try water sports and activities like snorkelling, horse riding, diving, cycling, hiking, windsurfing and fishing. The guests can also enjoy indoor games like table tennis, etc. at the hotel. Apart from that, the hotel also has a game room and a children’s playground. The guests can also try sunbathing on the nearby beach. The hotel also houses a high-end spa, where the guests can avail the services offered and pamper themselves.